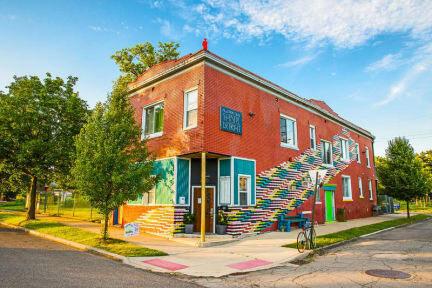 Hostel Detroit is an educational non-profit that believes that experiential travel is the best way to learn and experience the City of Detroit. It is a social space. Expect to make friends! We are located in a bright and vibrant 100-year-old building in a neighborhood that is full of urban farms and innovative projects. Easy transit- located 2 blocks from the $2 FAST Michigan airport bus line at Rosa Parks St. and Michigan Ave. and 10 minutes walk from the Greyhound bus station. We want to connect visitors to Detroit with the people and places that make our city great. We seek to provide context in an often misunderstood city. Our goal is to teach each of our visitors about the history and evolving future of our city. We want our guests to leave Detroit with the perspective of someone who has experienced it first-hand and was able to interact at a hyper-local level. We want them to eat from our urban farms, cycle our streets, enjoy the cities thriving small business community, connect on a personal level and take in our festive atmosphere. 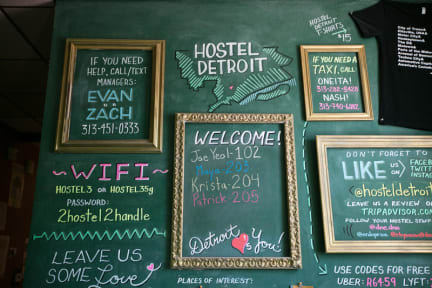 We help hostel guests tap-into what’s happening in Detroit. We offer maps, “adventure-planning”, self-guided explorations, and personalized tours led by local volunteer ambassadors.